When I’m not nerding out on Chicago history here at Chicago Detours, I have a second job life-guarding at what I think is one of the most surreal places on the north side of Chicago – the private pools of the Carl Sandburg Village. This complex, located in the Old Town neighborhood consists of 9 high rises and townhouses. Sandburg Village has more than 2,600 condo units and 8,000 residents. After two summers at Sandburg, I’ve discovered there’s more than meets the eye in quaint and classy Old Town. Walk through the neighborhood of Old Town today and you will have a charming experience of boutiques, bistros, and historic homes on picturesque streets. The signature wrought iron gate south of North Avenue on Wells Street welcomes you to a neighborhood known for its upscale sophistication and cozy, historic feel. Ask what to do for fun in Old Town and its residents, typically older and middle to upper class, will proudly suggest notorious Chicago entertainment venues such as hilarious The Second City, the respected Steppenwolf, or the eclectic Royal George Theater for an evening of comedy or drama. Sandburg was built as an urban renewal project—intended to spur redevelopment of the diminishing near north side from its dilapidation. The near north side had become a densely populated area where immigrants, working poor, and minorities lived together. Developer Arthur Rubloff labeled the area as “blight” or slums. Mayor Daley, city planners, and others were afraid the “unseemliness” would spread. They were especially concerned about the nearby Gold Coast neighborhood. The story of Sandburg Village and most urban renewal in city planning in the 1950s and ’60s took this approach: government takes the “blighted land,”government demolishes the homes and businesses of this area, government sells the cleared land to developers, developers make buildings with high rent and attract a wealthier, young urban professionals (sometimes abbreviated to yuppies) to the area, pushing previous inhabitants out. In this particular case, Puerto Ricans were one of the largest minority groups in Old Town in the ’60s. They subsequently moved south and west to Humboldt Park. Urban renewal and gentrification are often controversial. Indeed, the impact of Sandburg Village is still hotly contested. On the one hand, it revitalized the entire near north side. Nearby neighborhoods, such as Lincoln Park and Lakeview, followedin its wake. Wells and Halsted streets in particular are dotted with high-end retailers and avant-garde restaurants. On the other hand, Sandburg Village displaced many and is accused to have been built without due process. It is also sad to see historic buildings demolished. 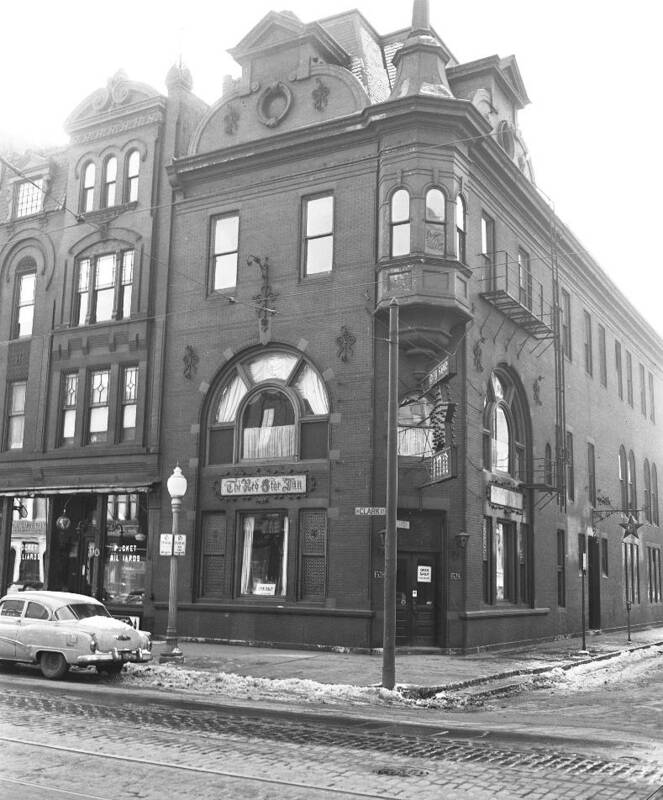 I wish the Red Star Inn (pictured above) hadn’t been cleared away for modern construction. The architecture and layout of the Sandburg Village complex indicates the desire to be a secluded “village within a city.” Today, people have trouble locating the two swimming pools, the tennis court, and even front yards of townhouses. They’re all hidden behind tall, dark brick walls. There’s very little visibility from the street. So it’s obvious that the complex preferred privacy and exclusivity from the outside world. To me, that is the bizarre part of Sandburg Village and Old Town – there is no way to escape the poor population that was pushed out of Old Town; odd juxtaposition of the pristine shops at North and Wells versus the panhandling only a few blocks away at Clark and Division. What are your thoughts on the positives and negatives of urban renewal?